Game review: Multitasking Is Not My Thing. Multitasking Is Not My Thing. Ohaider everyone, this is Mash again with another review. This time I'll be reviewing a PPG called 4 Tasks. It's made by Gerald 123. I've reviewed quite a good amount of games from Gerald because I know he makes games that are really, really good. I can say that the PPG is something he's really good at making. I'm astonished by his game making skills and of course, his games. I can say that I'm pretty sure this game would be able to impress me as well, if it doesn't well... Then I guess I was wrong. But, I highly doubt that. So, just by hearing the title of the game kind of discourages me to play. 4 Tasks, I can already tell what's gonna happen in this game just from the title. There are quite a lot of games that use the same concept, like Splitscreen, for example. You have four characters and you somehow need to be able to get to your goal by controlling all of them and avoiding the obstacles and challenges present in the game in order to do so. This game is pretty similar to a lot of games, it's pretty unoriginal already. But, that won't really stop me from playing. Who knows, it might actually be better than all of the games with the exact same concept... or worse. Anyway, the first thing you'd see once you 'Click to play' the game are four tiny screens, four colorful areas with four colorful characters. 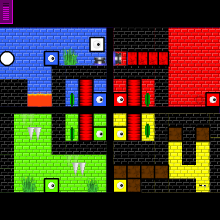 The bright colors used in the game may both encourage and discourage the person from playing, depending on that person's preference. But, I liked it so...yay? So, it took me about an hour to finish the first level. (Omg, I'm so pro.) 4 Tasks is an amazingly difficult game for me, I wasn't really able to get that far into it. But I was able to watch a walkthrough on this game, and I have no idea how you guys are actually finishing this game. Maybe I'm just bad at it because I kind of bleep when it comes to multitasking or something. Or maybe I'm really just a bad player and I just don't want to admit that too often because it makes me feel bad. Anyway, even if it did take me a while to actually progress in the game, I found 4 Tasks to be a really addicting game. You'd shout, scream and curse at the game. It just felt to annoying losing to it because it looks so simple. But it reality, it isn't. Despite the near impossible difficulty that the game had presented, I think it was still able to be a really, really enjoyable game. The placements of this game were top notch. Everything was placed in a pretty organized manner and in a way that it's almost impossible not to avoid the hazards in the game. Though sometimes identifying which was what in the game could be pretty confusing, the placements were still pretty good. It wasn't entirely perfect, but they're pretty impressive. The hazards came and go, they were here and there and everywhere at the right time. The block placements and the way everything was arranges was splendid. 4 Tasks was really difficult, but it wasn't something like "Once you start to play, you immediately die because there's this hazard/enemy that you can't even avoid because you didn't even know it was there" kind of game. It was more like "If you have no brains or any hand-eye coordination, you're screwed." kind of game. Sadly, I don't have both. D: Though I've been praising the placements this whole time, I do still think there's something missing. I really liked the design of 4 Tasks. For me, it was colorful yet simple in a way. It didn't overdo the colors nor the graphics. It was a good mix of both and it made the game 'pop.' The bright colors sort of came off to me as an encouragement to play more. The design of this game overall is spectacular. I didn't find anything bad about it at all. It didn't even feel off, not one bit. As for the thumbnail, I think it's a very astonishing one. Everything looks pretty complicated and it perfectly described the whole game in that single picture. Complicated and difficult but a very colorful game. The whole concept itself wasn't the newest of concepts, but I like how Gerald was able to actually make it stand out from most of the games with almost the same concept. The crates blocking your way and the annoying and sudden addition of a fifth player in the game was pretty good, I must say. The overused concept that 4 Tasks had was basically the only reason why this category didn't get a perfect score. The placements were very impressive overall, but something's missing. It just didn't feel right to give this a perfect score. The concept was overused, but Gerald was able to make it stand out and make his game unique in a way. 4 Tasks is a very addicting game to play, nuff' said. The game is a bit too difficult, but that difficulty is what enhanced the game and made it more fun to play. This review was originally made on: 5/11/14.